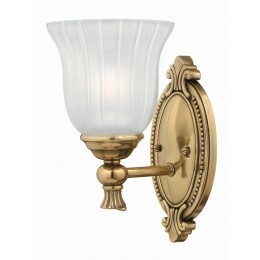 The Hinkley 5580PL is a 1LT Wall Sconce light fixture in the Polished Antique Nickel finish with Frosted Ribbed Glass. This light fixture is from the Francoise collection and is Underwriters Laboratories (UL) & Underwriters Laboratories of Canada (ULC) Approved. 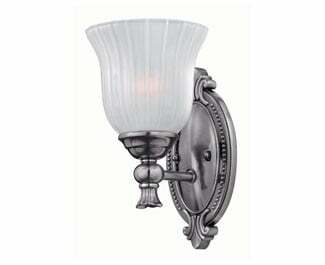 To view further details of this Hinkley Lighting Outdoor Light, see Lighting Fixture Features above. 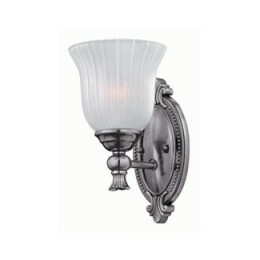 The Hinkley 5580PL Francoise collection Sconce Wall Lighting in Polished Antique Nickel uses Incandescent light output and brings Antique style. This item is 10.75"H x 6"W x 7"D. The wattage is 100. The Hinkley 5580PL requires 1 bulb (not included). Additional Information: Shade-Frosted Ribbed Glass.